And the other day the building got a new sign. He was an early proponent of secession and an ardent supporter of slavery who used the Bible and Christian teachings to justify the institution. But what I find interesting now is the recurring observation of how ironic it is that what was once called Women’s Studies (now part of the Department of Gender and Race Studies) is also located in Manly Hall. While I certainly understand how this might strike someone as ironic, at best, or, at worst, a surprisingly blatant representation of how marginal positions are continually subsumed within dominant discourses, I think there is more going on here than first meets the eye. For, in order to see the irony, it seems to me that one must presuppose that gender = feminine (which, ironically, naturalizes masculinity as the norm, as if it is neutral or non-gendered), for only then can our neighbor’s placement in Manly Hall be judged curious. If, however, one takes seriously not only that Department’s recent name change from “women” to “gender” but also that gendering encompasses the acts of creating lasting impressions of femininity and masculinity as well, thereby taking seriously that both identities — as with all identification, such as with race too — are forever co-constituted by means of their presumed other, then the happenstance juxtaposition of a modern Departmental identity and an historic Alabama surname is either less than interesting or, at its best, a profoundly illustrative moment in the ongoing dialectics of situated identification. For to act manly — whatever that may signify to you — is just as gendered as anything else, no? 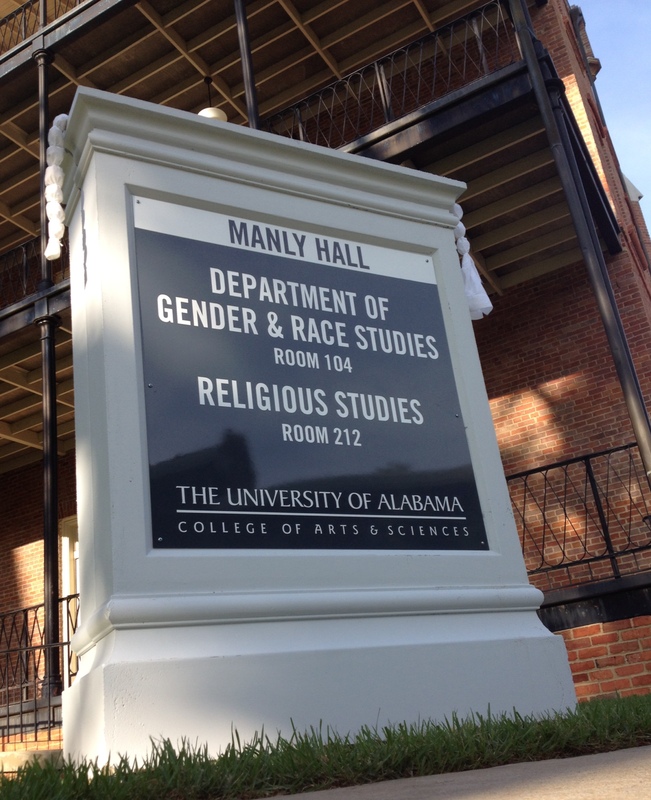 This entry was posted in Faculty Blog, Relevance of Humanities, Religion in Culture and tagged Basil Manly, Binary, Dialectis, Discourse, Gedner, Identification, Identity, Ideology, Irony, Manly Hall, The University of Alabama by Russell McCutcheon. Bookmark the permalink.